The ACF is taking the lead in the prestigious international Fly a Flag for the Commonwealth initiative by taking the Commonwealth flag to the top of some of the highest peaks in England, Scotland, Wales and Northern Ireland on Commonwealth Day - Monday 13 March 2017. As well as the mountaintop ceremonies, Army Cadets will observe Commonwealth Day by raising the flag at 53 other locations, including Stonehenge, Gloucester Cathedral and the Liver Buildings (overlooking the river Mersey) at 10.00hrs that morning as part of this international initiative. Lord Mayors and Mayors, Lord Provosts, town and parish councils, local authorities and local communities, school children and college students, members of Girlguiding and the Scouts from around the UK and Commonwealth, Sea and Air Cadets, charities and community groups, Commonwealth Ex-Servicemen and major shipping lines, training ships crewed by disabled crewman people, and many others around the world will raise more than 950 Commonwealth flags at 10.00hrs local time on Monday 13 March – Commonwealth Day 2017, in a shared celebration of the Commonwealth’s family of nations. The Fly a Flag for the Commonwealth initiative, now in its fourth year, enables participants to show their appreciation for the values the Commonwealth upholds, and the opportunities offered for friendship and cooperation with fellow Commonwealth citizens, young and old, around the world. 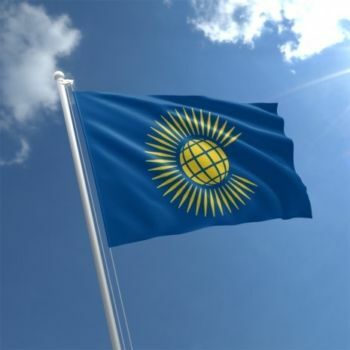 A personal message from the Secretary-General of the Commonwealth of Nations, The Right Honourable Patricia Scotland QC, and a specially written Commonwealth Affirmation, will be read out at each ceremony before the raising of the Commonwealth flag at 10.00hrs. In a common act of witness the ceremonies will allow Commonwealth member states to reaffirm their commitment to democracy, development, and respect for diversity. Adult volunteers and 15 cadets from Bulford, Larhill and Sarum Academy detachments in Wiltshire ACF will raise the flag at Stonehenge (with permission from English Heritage). Merseyside ACF and a number of VIPs will be raising the flag at Liverpool's Liver Buildings. Weather permitting, 1st Battalion the Highlanders ACF will set off at 0500 hours to reach the summit of Ben Nevis in time to raise the flag at 1000 hours. The group may include canine companions. Capt Alan Leckey will lead a team of senior cadets up Slieve Donard in Northern Ireland to raise the flag. Adults from Cumbria ACF will be raising the flag on Murton Pike near Warcop. Weather permitting, Clwyd and Gwynedd ACF will be raising the flag at the top of Mount Snowdon. More information on the event is available in the Fly a Flag for the Commonwealth guide.